At a time when it wasn’t believed there was anything more to add to the common pencil, came a tour de force from the world’s oldest and most important pencil manufacturer. This stunning triangular shaped silver coloured pencil with raised black dots on the sides immediately became an icon of industrial design, winning numerous international awards and being named the Business Week’s “Product of the Year”. A pencil? Yes, a bold new pencil that stepped forward with innovative new features and a look that placed it in the realm of high end writing instruments and fashion. A marketing campaign that placed the pencil in art stores, quality stationers, and fountain pen shops accompanied by attractive merchandising was the essential companion in gaining attention. Arts sponsorship and pencil themed fashion shows were among the noteworthy campaigns. Making almost two billion pencils a year, Faber-Castell is the world’s largest pencil company. Their pencils were the world’s first branded writing instruments, and their corporate origins are in the eighteenth century. It seems they haven’t reached these heights by resting on past accomplishments. The UFO eraser and sharpener, the perfect pencil – each of these would be an incredible achievement on it’s own. But Faber-Castell keeps pushing the boundaries of the what a pencil can be. The potential position in the public consciousness is elevated by each new addition. Even a new eraser wins design awards. Nothing is ordinary about their creations. The pencils are simply beautiful. They are both functional and attractive. The triangular shape fits the hand nicely, and the black dots do assist with “grip”. (Unfortunately, in high humidity, they do get a bit tacky, and can stick to other objects.) There are nice hidden touches – the head of the eraser-less pencil is black, with the shade corresponding to the hardness of the graphite. Of course, they’re also labelled on the side. It’s the sort of pencil that gets the attention of people who don’t like pencils, and the renewed devotion of those who already have them at their desk. Of course, those who like the ordinariness (and price) of the office supply store dull yellow pencil, perhaps as a badge of honour, won’t want this upscale version. There is a matching triangular eraser (also produced in at least red and blue) available, or matched eraser caps, sold in pairs. Of course the pencil looks so nice that a stylish UFO eraser seems made for it. They come in five hardnesses, 2H, H, HB, B, 2B, and so are meant more for writing rather than drawing. I’ve used them for about four years, and some leads are better than others – the odd one seems a bit scratchy, or breaks in such a way that there are two pencil lines. That can be a bit annoying, but is luckily not the norm. I also notice that the pencil’s halves are sometimes a bit mismatched in colour. This isn’t a serious problem – in fact I believe the pencil’s amazing looks highlight the little imperfections. Can Faber-Castell top this pencil? I don’t see how, but I’ll keep watching. I lost my daughter’s favorite eraser, the one in your picture. I’ve search the web but don’t know where I can purchase one. Any ideas? Do you know where to purchase a Faber-Castell in Canada? In Canada? Loomis and Toles, Laywine’s, Sears, and Essence du Papier are some retailers that come to mind. There are other sources online. They are sold at cultpens.com – they ship worldwide! There is another model of Grip 2001, a black eraser attached model. 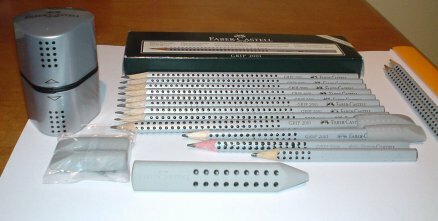 As I know, lots of north American people loves erasered pencils, so it is quite strange that it’s a bit hard to find erasered model of Grip 2001 and Castell 9000. By the way, I had changed the title of my blog. Would you correct the link name? Kent, the link is corrected. Does the bilingual name mean that you will start having some English language content? I’ve seen the erasered Grip 2001 in Canada, though I haven’t purchased any. I do have a few erasered 9000s. I believe there are also some blue and red Grip 2001s in some markets, though I’ve only seen online photos. Oh. Because I can see only the Canadian or U.S. online pencil stores, I have thought that it’s tough to find erasered Grip 2001 in north America. I am planning to translate my articles in English. Some of them are already translated, and I will post them soon. I need to find faber castel products in Winnipeg! can anyone help? Faber-Castell in Winnipeg: I believe “desart” at Osborne sells a few Faber-Castell pencils. And you can order/purchase Faber-Castell and Graf von Faber-Castell products from “u.n.luggage”. That’s where I bought my UFO Design Perfect Pencil gift set. An online alternative would be stylo.ca. Faber-Castell in Winnipeg (update): I found another store that carries Faber-Castell. It’s “Colours Art & Framing” (www.artistsupplies.com). They’re at 337 Pembina Highway, about half a block away from Fleet and Pembina intersection. There phone number in Winnipeg is (204) 956-5364. I got a 3 pack from a Staples store in Phoeniz AZ when I was traveling for work back in April 2008. This week I cracked open the package. My 3 pack came with a sharpener, an eraser, and a 2B, B, and HB pre-sharpened pencil. Each pencil has a bar code as if it could be sold separately too. I’ve been sketching with the 2B pencil and it works well enough. It writes smooth and makes nice dark lines. The triangular shape is easy to grip and the dots help with some positive traction. Unfortunately, the dots don’t work well in my Berol/Chicago/Apsco manual sharpener. The sharpener tries to rip the dots off but is unsuccessful. They are half way attached and stick straight up. I need to finish the job and pull them off. The wood doesn’t seem exotic and it has a rough and course grain. Enjoy! According to an article from the International Herald Tribune Faber-Castell’s pencil output jumped by double digits between 2001 and 2003, in large part due to the Grip 2001.